The tiny Glerp-Toed Hizjiffle uses its sticky green skin to pick up germs from public restrooms, subway seats, elevator buttons, and other disgusting surfaces handled by thousands of unwashed hands. Then it likes to crawl through your sinuses and over your tonsils. 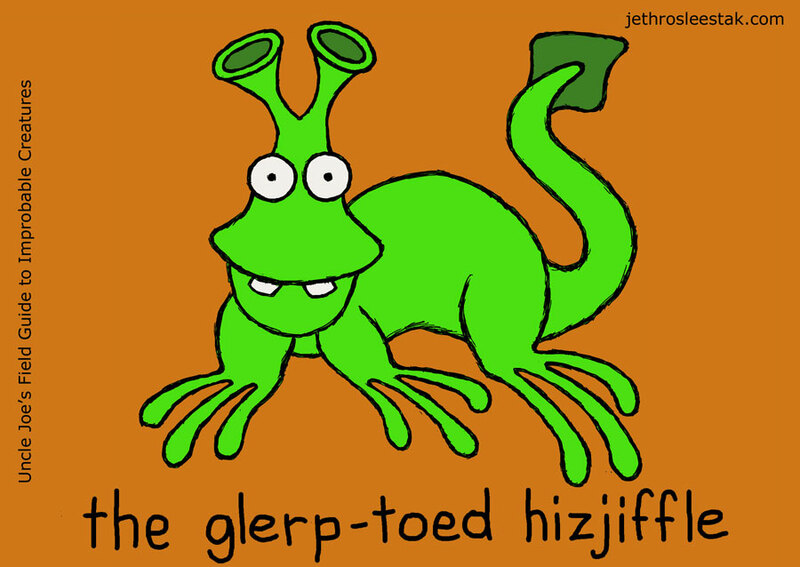 When you first feel that burning sensation when you swallow, you can be sure the Glerp-Toed Hizjiffle has paid you a visit sometime in the past hour. The ancient Aztecs made edible Hizjiffle effigies from lime Jello, tequila, and the blood of sacrificial victims. These effigies were ingested by the Aztecs in large quantities before battles and before enrolling their children in daycare in the hopes that it would ward off the Hizjiffle so that they not have to miss every other goddamn day of work just to stay home with sick kids who can’t seem to keep their fingers out of their noses and mouths and pick up every goddamn bug that comes around. The mucous secreted by the Hizjiffle’s skin is used to make non-dairy creamer and powdered protein shakes. The process used for this was discovered during World War II by German scientists hoping to develop synthetic lubricants for tanks. Any surface in a public place during cold and flu season.